Last month I had a meet down in the LA area and for the first time decided to actually rent a car. I was dreading the whole idea of renting a car because of all the horror stories I've heard about the process. Luckily I was able to pick up the car with no problems. When they walked me to my car I was a little confused, as I had never before seen the Hyundai Accent GS 5-Door. The attendant told me the keys would be in the car, and I made my way to my new travel assistant for the weekend. Initially I was still a little hesitant as the car seemed too small and compact for me. I'm used to mid-size cars so the small compact Accent was definitely a change. As I pulled out the lot the car just felt good! You all know that feeling; new car, new car smell, nice day out, radio blasting, and a smooth set of wheels. The controls were easy to find, easy to control and everything just felt, like I said GOOD. I can honestly say the only thing I didn't like about the car was that it felt really light weight. One day it was a tad windy, and it felt like I was more outside the car then inside the car. The car weighs 2,489lbs and is probably the lightest car I've ever driven. Other then that minor detail, the handling was awesome and the 11.4 gallon tank only needed to be filled once after driving around LA the whole weekend. Since I was on the highway more, the 37MPG really came in handy with that. The interior was a tad cramped so I wouldn't recommend the car as a family car, but if you are looking for something compact, good on gas, and has the basic features, then this car is for you. After driving it I decided to look up more of the specs and see the pricing. 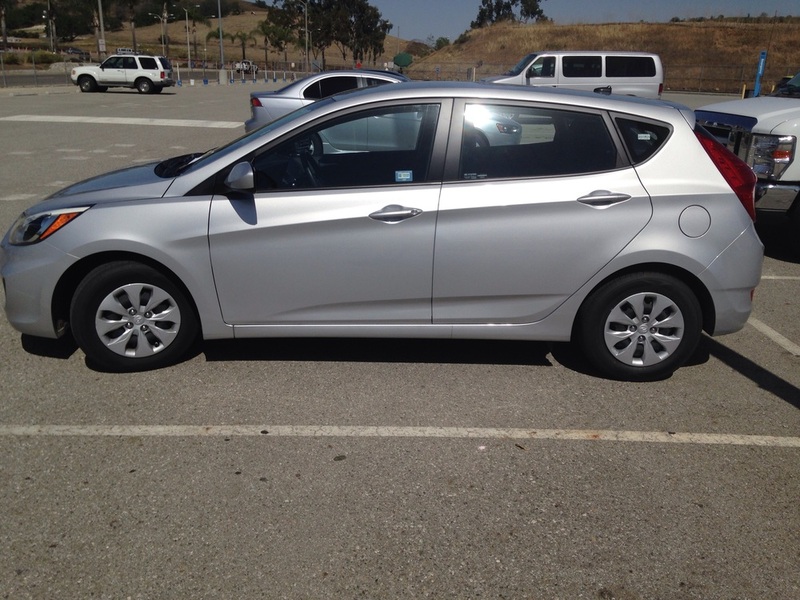 The new 2015 Hyundai Accent GS 5-Door runs for $14,995MSRP, and there are two other cars under the Accent name (GLS and Sport 5-Door). Make sure to go give it a test drive if you are looking for a new car, you won't be disappointed. As I am looking for a car myself, this one doesn't fit my ideal car wants, so I am still on the hunt for "my" perfect car. I can say now after driving this Hyundai, the next one on my list will be the 2015 Hyundai Genesis Coupe. There is something about it that just screams "Take Me Home!" What car are you currently driving, and what do you love about it? I would love to know as I am on my search for a new car.